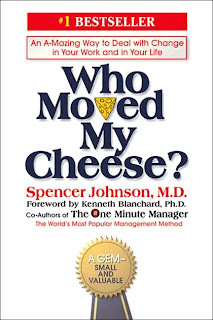 The book of the week was Who Moved My Cheese? by Spencer Johnson M.D. I had a hard time picking up this book because it is metaphor based and, generally, I like non-fiction. However, this book is used by Anheuser-Busch, Apple, Kodak, the Army and many other large organizations. It is used as a tool to shape the minds of the members and give a new perspective on the subject of "change." The book's author was a co-author of the very popular book The One Minute Manager. His writing is very easy to follow and both books are very simple and short. Who Moved My Cheese is about two mice named Sniff and Scurry, and two "littlepeople" named Hem and Haw (littlepeople are basically people that are the same size as mice.) The four main characters are in a huge maze and their goal is to find the cheese in the maze. They all head out on the first day and after some searching they found their cheese station. Everyday they raced out to get to their cheese, but eventually Hem and Haw started going slower and slower, knowing the cheese was going to be at the station when they got there. Hem and Haw got comfortable with their cheese, always in the same spot everyday. Then one day it was gone. When that day came for Sniff and Scurry they weren't surprised, they just raced off to find the next area the cheese was going to be held. Hem and Haw on the other hand got mad. That cheese was "theirs" and it shouldn't have been taken away. Instead of adjusting to the change, they got angry and refused to move on. For days this went on... and while Hem and Haw were refusing to move on, Scurry and Sniff found a new cheese station which was filled with more cheese than they had ever seen. Soon enough Haw finally realizes that they had been foolish and he wanted to move on. Hem discouraged this and was afraid to move on, he said it was too dangerous to try something new. Haw left Hem and went out to search for new cheese. It took a long time, but Haw eventually caught up with Scurry and Sniff at the new cheese station. After realizing that he had been foolish at being angry about the cheese being taken away, it turned out to be a great thing to adjust to the change. Throughout Haw's journey to find the new cheese station he wrote little sayings on the wall to keep him motivated. Here are the saying: Change Happens, Anticipate Change, Monitor Change, Adapt to Change Quickly, Change, Enjoy Change, and Be Ready to Change Quickly And Enjoy it Again and Again. Now I basically outlined the whole book for you but it's still a great tool and there were a lot of details I glossed over. The point, however, is that you need to learn how to anticipate change. Again and again, people get too comfortable and they feel entitled to the lifestyle they have. Most people even make plans based off the current lifestyle and that's fine as long as you know that change can come fast and hard. Anticipate that! It can come in the form of getting laid-off, having to move your family because a relocation, or in the form of changing your job function all together. A helpful story by Kenneth Blanchard from the Introduction of the book helps illustrate this idea... There was a sportscaster named Charlie Jones and he said Who Moved My Cheese saved his life and career. Charlie had always worked hard and done a great job at broadcasting Track and Field at the Olympic Games. Then one day his boss told him he was being removed from showcasing these events and had been reassigned to Swimming and Diving. At first it affected everything Jones did. He was angry and frustrated and didn't think it was fair because he thought he was entitled to do Track and Field. After he heard the story of Who Moved My Cheese, Jones laughed... he realized he needed to change his attitude. He realized his boss simply "moved his cheese" and he adapted. He learned everything about swimming and diving and became the best sportscaster in the event. His new energy was noticed and he was assigned bigger and better assignments regularly and eventually Charlie Jones was inducted into the NFL's Hall of Fame - Broadcaster's Alley. I think it is very important to anticipate and adapt to change. That is what makes the difference between being average and being GREAT... No matter what the change is in your life, stay focused and go out to get the next "cheese" that's waiting for you. Every time we adapt our lifestyle to change we get stronger and that experience guides us into a more successful version of ourselves. Grab a copy of this book, it is a very valuable metaphor. If you have any questions on the book don't hesitate to ask. I would be more than happy to help anyone that wants it. Amazon Link to Buy Who Moved My Cheese? I had always heard wonderful things about this book, but never knew what it was about. This week I read The Tipping Point by Malcolm Gladwell. I really didn't know what to expect when I got this book. The subtitle is- How Little Things Can Make a Difference- so I figured it would be about service industries and customer service. I was very wrong. The Tipping Point is the point at which a common phenomenon becomes an overall epidemic. This book is all about trending social behaviors. It gives several cases where a trend explodes unexpectedly and why it happened. It discusses events such as massive crime waves in New York, the research that grew Sesame Street to an educational empire, and even the cause of high suicide numbers in Micronesia. All of which are very eye-opening. 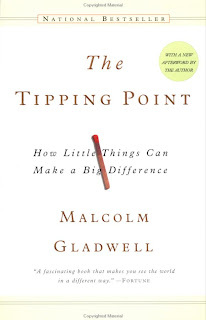 Gladwell writes that the three rules of the Tipping Point are The Law of the Few, The Stickiness Factor, and the Power of Context. The Law of the Few is about the people that will popularize an idea and make it known to the masses. They are called Connectors, Mavens, and Salesman. Everyone knows one of these people and these people know everyone- which is what causes an idea to spread like wildfire. The second rule is The Stickiness Factor, this is the way an idea is presented, a way that will make it stick to its recipient. Sesame Street used years of research studies to balance their show to the right amount of Muppets and education. This research was a success that resulted in Sesame Street having an 84% retention rate among children. Lastly, the rule of The Power of Context, this is how an environment can affect how the mind works and stimulates behavior. In New York, to decrease the amount of crime in subways, the city cleaned or painted over the graffiti on subway cars. It made the environment better and the minds of the people who were around it followed the same trend and crime rates decreased rapidly. I had an interesting idea while reading this book. I would like to present a challenge. I think there are several Connectors, Mavens and Salesmen (and women) that read this blog. I would like to see how effective you would be in getting the word out about this blog. Right now, I have a readership of about 350 readers per month. I think with the support of "the few" I could increase this number greatly. If you think you are one of these people, see what you can do. Tell some friends and let's see if we can make our own epidemic. This book was really great. I think anyone that reads it will walk away with a different perspective on life. The last case study in the book over cigarette smoking is extremely interesting. If you have any questions on the book don't hesitate to ask. I would be more than happy to help anyone that wants it. Read the Writing on the Wall... It's Time for Gold and Silver! I have to give credit to my friend Steven for opening up my eyes to the idea investing in precious metals. The book this week was Guide to Investing in Gold and Silver by Michael Maloney. This book was brilliantly written and all the historical concepts really backup the main point of the book perfectly. I look around and I see the signs.... CashforGold.com... or send us your gold... or some people just buying up gold out of the laundromat. There is writing all over the walls, and it's up to you to read it. There are a lot of people out there that are catching on to the fact that something is going to happen with the price of gold and silver soon and if you are smart you will get on board to make some money for yourself too. The book is all about why it's a great idea to invest in gold and silver and how to do it effectively. The book is broken up into 4 portions: Yesterday, Today, Tomorrow, and How to Invest in Precious Metals. The first half of the book walks the reader through the history of gold and silver being used as currency and the value in relation to fiat money. The point that is very eloquently laid out is that gold and silver always win. Historically, it can be traced back to Athen's... nearly the same concepts were put into practice regarding currency as they are today. The great thing about the timing of this book is that we are in the midst of the next great rise in precious metals. The U.S. government just injected trillions of dollars into the economy... this causes inflation, which Maloney refers to as a "stealth tax, " and devalues all the dollars are already in circulation. What is great about gold and silver is they aren't effected by inflation. The trend of gold is steady and that is why it has been used as a shield to inflation for so many years. Maloney expects gold and silver prices to skyrocket soon. There are several different fuses explained in the book that will ignite the value of gold and silver. Honestly, I don't think there is any downside to owning at least a little gold and silver... Trending shows that the prices are steadily rising, so the worst that could happen is you shield yourself from the excessive inflation we are going to incur and the best that could happen is hyperinflation and the ability to cash in your commodity for big bucks. I am not trying to make light of a serious situation, I am just trying to advise you to guard yourself. The wealth transfer during a hyperinflation will be incredible, so it would be wise for you to be prepared. 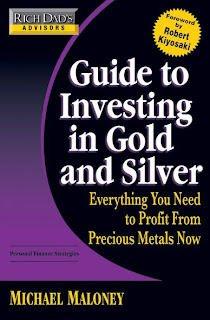 The book explains that it is best to invest in .999 pure 1 oz silver or gold. You can get an America Silver Eagle 1 ounce .999 pure silver for about $17.00 right now. Maloney says that he would not be surprised if silver shot up to over $100 an ounce and maybe even $1000 an ounce. Maloney's website is www.GoldSilver.com I really do hope you become interested gold and silver investing because of all the investment advise I have written about this one doesn't appear to have a clear downside. I recommend you read this book or at a bare minimum check out his website. If you have any questions on the book don't hesitate to ask. I would be more than happy to help anyone that needs it. 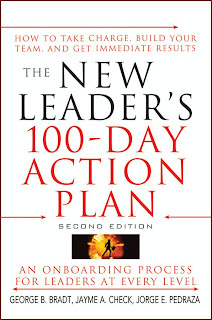 The book this week was The New Leader's 100-Day Action Plan by Bradt, Check and Pedraza. I have been really excited to read this book because I am moving into a new job as a leader. I did not expect the book to be written like it was though. I was surprised to find it more of a workbook than anything else and very affective in doing that. 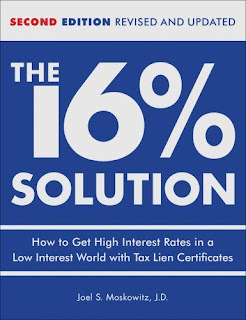 As you progress through this book each chapter explains a point in the onboarding process, then tells you how to prepare, and then at the end of the chapter it helps you write out that preparation in a "fill in the blank" style. Not only does it give you the organization of these preparation forms in the book but the same forms are downloadable on the books website. Very handy in my opinion. One thing that made me wish that I would have read this book before I did is that they start the onboarding process into an organization before your first interview. They identify the common interview questions and give you example answers which were very helpful. This book follows the principle that you can't say yes or no to a job you never get an offer from, so go all out and try to get an offer from as many companies as you can and then after all the offers are on the table, and only after, do you due diligence on that company and find out if they are the best fit for you. In this economy I couldn't think of a better way to go about getting a job. Go for everything under the sun and then you'll leave yourself with more of a selection. And if you use this book as a guide you should be able to perfect you impressions and really make a great impression come interview time. Overall, as I read through this book most of the information was common sense. However, it is nice to have it all laid out because if you don't have everything you ought to do fresh in your mind on your first day... chances are you will forget it. Then as you progress through your first 100 days at your new job, using this book as a guide/workbook, you should be making early wins and bringing all the "right" types of people aboard your team. These two things are key to making a big impact on any organization and getting ahead faster than you thought possible. I think this book is perfect for everyone out there who is in the process of looking for a job or internship. I wish I would have known that onboarding starts even before the interview and how the early wins even before your first day can influence your overall career outcome. Addtionally, to those of you that have a steady job, even though a lot of the information in this book was common sense, I know that if you read it you'll learn at least one thing that you will be able to apply to you leadership role within your organization.... and wouldn't that make it worth it? If you have any questions on the book don't hesitate to ask me a question. I would be more than happy to help anyone that needs it.